Cheap lower end LCD monitor for home users. 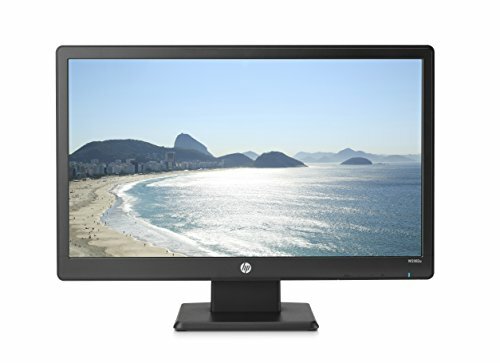 The HP W2082a 20-inch Widescreen LED Backlit LCD Monitor is built with a slick design and quick set-up features. This is a simple solution when connecting to your desktop or notebook computer. The slim profile design and 20-inch diagonal screen allow the monitor to be placed into tighter spaces than larger displays. You also benefit from VGA and DVI-D inputs allowing the display to be plugged into a variety of PC configurations, while built-in speakers eliminate the need to plug in standalone speakers. Display: HP W2082a Monitor has a flat display panel with LED Backlit screen. This is made with arsenic-free glass and a mercury-free LED panel. Resolution: This unit has highest resolution of 1600 x 900 screen resolution. That’s mean, it is an HD monitor, but it will not offer a Full HD experience. In 20-inch Backlit LCD screen with 60Hz refresh rate, a regular user will not see much difference and this monitor was not targeted for gamers or high-end users. Aspect Ratio: This HP W2082a LCD Monitor has 16:9 aspect ratio. 16:9 aspect ratio is industry standard now and unless the model is for any specific use, all company build their monitors in this aspect ratio. This aspect ratio is best for watching movies, HD tv channels, youtube videos as most of camera and camcorders shoot now in HD mode and this very same aspect ratio. As the monitor support 60Hz refresh rate, though it’s not Full HD, user will receive a quite good experience. So, if you are looking for Full HD, high-performance, extraordinary viewing experience, this is not your unit. Contrast: Static Contrast ratio of 600:1 and a Dynamic contrast ratio of 1 Million:1 is pretty basic contrast. As this monitor is targeted for basic users, this contrast can be ok for user. But if you planning to see Sci-Fi movies or movie with a lot of graphics, you will miss some colors, but I bet, only very few users can really see the difference. The colors will not be very vibrant, that’s it. Response Time: 5ms response time for this monitor is pretty good. Plugs & Ports: This monitor has only VGA, DVI-D, Audio In and power port in it and all of them are placed on the backside. Connectivity: This monitor provides VGA and DVI-D connectivity for graphics input. Easy to install. Plug & Play only. Every person does not need a high-end monitor. Not everyone is a gamer, movie geek or photoshop expert. Some just browse the ever-growing internet, watch simple youtube videos, do some personal or official word processing and spreadsheet programming. If all of them or any 2 of them are true with you, you can have this monitor as this monitor is going to save your wallet as well. A low-end cheap LCD monitor with 16:9 aspect ratio and 1600 x 900 resolution. If your use is basic, if its the 2nd or alternative monitor in your home or office, if your budget is tight, this is your monitor.